We offer remote support if you need it. Do you want us to log into you computer and help you with the Vikingen software? 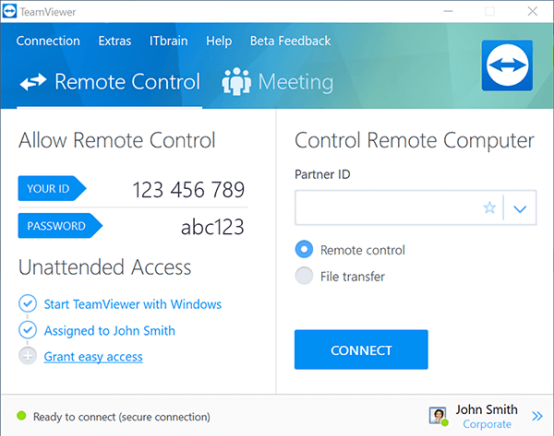 Teamviewer is a thirdparty software which allows us to log into and control your computer from our offices. This way we can offer you first hand help without sending a technician to your residence. Click on one of the buttons to the right (PC or Mac) to download the program. For more information about the software you can visit the Teamviewer Website. It is available for both PC and MAC computers. Once you have installed Teamviewer you will need to send us an email with the login details for the Teamviewer application along with a description of the support you need. The Details we need are your Teamviewer ID and your Teamviewer Password (See image). We also need a detailed description of the support you need so that we can identify the problem. Once we have received your email will we at our earliest possible moment log into your computer and work on solving the problem. You do not need to be present by your computer for us to be able work, however you must make sure to leave your computer powered on and have the Teamviewer application open and connected to the internet.